Lone Star Cyclists proudly sponsor the 33rd Annual Tour d'Italia. 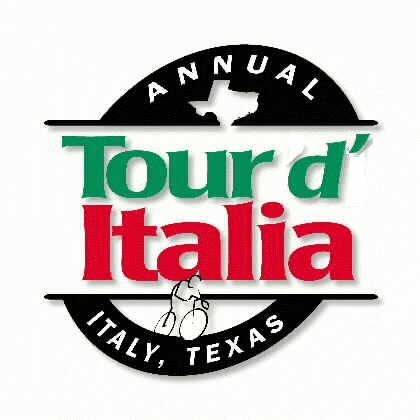 Benefiting Italy High School, the Texas Scottish Rite Hospital for Children, and other North Texas charities, Tour d'Italia enters its 33rd year, bigger and better than ever. Join over 1400 riders to earn one of our collector-quality T shirts and post-ride snow cones! You must pre-register to be guaranteed a shirt. Camping is available at the high school, and in the air conditioned gym. The ride begins at 8:00 am. June 16, Saturday Jambalaya, beans and potato salad. Cost is $7.50. This is a fundraiser for the school's Civil Air Patrol. Proceeds for these support Italy High School. Enjoy free snow cones, a cold drink, and a hot shower at Italy High School.